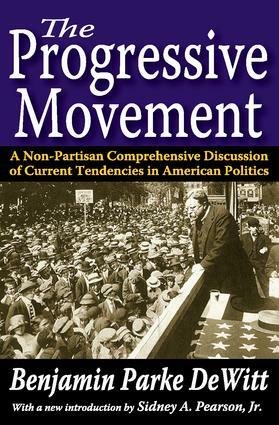 Benjamin Parke DeWitt's study of the Progressive Era represents a comprehensive history of the theory and practice of politics from a progressive perspective. His account of the history and projections about the future of the progressive science of politics provided the American liberal-progressive tradition with its first full narrative history at a time when it was not yet the dominant interpretation of the American political order. Its greatest importance, however, lies in DeWitt's conception of where the broad-based progressive critique of the Founders' was heading.DeWitt's history of the origins and projected destiny of the progressive tradition commands a respect that places him in the same company as better-known writers. His historical narrative of the liberal progressive tradition was implicit among a number of writers before the Progressive Movement, but no contemporary writer provided a better roadmap of where progressivism was going than DeWitt. What gives DeWitt's critique a twist is his focus on the individualism of the founders, which he regards as the heart of their anti-democratic principles. His critique of this individualism is the foundation for his argument that collectivism is arguably a more democratic alternative.Benjamin Parke DeWitt is one of the lesser-known, often overlooked writers who worked to establish the liberal library of American political thought. This book deserves to be read as one of the neglected gems of the Progressive Era that it chronicles. This is an important addition to the Library of Liberal Thought series.